Prime Minister Justin Trudeau holds a press conference at the G7 summit in the Charlevoix town of La Malbaie, Quebec on June 9, 2018. 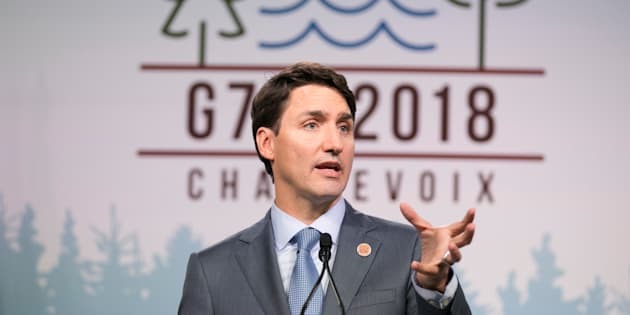 Prime Minister Justin Trudeau forcefully responded to Donald Trump's trade threats at the Group of Seven summit in Quebec, vowing Saturday that Canada won't be "pushed around" in a confrontation with the U.S. The war of words between Trudeau and Trump escalated after the U.S. president left the meeting early. Trump fired back at Trudeau's comments in a tweet later Saturday that called the Canadian leader "meek and mild" during the meeting of allies. The president also tweeted that he was revoking U.S. endorsement of the summit's final joint statement. "Canadians ... stood shoulder to shoulder with American soldiers in far off lands in conflicts from the First World War onward," the prime minister said at a press conference at the end of the summit. "It's kind of insulting." "Canadians, we're polite, we're reasonable, but we also will not be pushed around," Trudeau continued. He said the country won't hesitate to impose its own retaliatory tariffs. "The president will continue to say what he says. I have made it clear to the president that [imposing retaliatory tariffs] is not something we relish doing, but it's something that we absolutely will do," Trudeau said. Trump quickly responded on Twitter that he was surprised by Trudeau's comments because he found the prime minister "so meek and mild" at the summit. "Very dishonest and weak," Trump said. The president also referred to Trudeau's "false statements," which he didn't explain. Trudeau's view of how the summit went was a marked contrast to Trump's take. The president had described the G7 meeting as cordial, even though he accused the U.S. allies of treating America "like a piggy bank." He touted the "great meetings and relationships," and said that the other leaders "understand where I am coming from." Trump threatened at the meeting that the U.S. would end all trade with nations that refuse to end "unfair" trade practices. "That's a very profitable answer if we have to do it," he said at a press conference. But the president also suddenly called for tariff-free trade among all the countries — just a week after he imposed a 10 percent tariff on aluminum and 25 percent tariff on steel from Canada, Mexico and the European Union. Free trade is "the way it should be," he said. Trump further annoyed the allies when he called for Russia to be welcomed back into the group. The country was expelled after its annexation of Crimea in 2014. The president was late to the summit Friday, and also arrived late Saturday for a working breakfast with the group's General Equality Advisory Council. Trump left the summit early on Saturday before sessions on climate change and the environment.